LOS ANGELES, California (CNN) -- A man apparently despondent about losing his job killed his wife and five children before turning the gun on himself, officials said Tuesday. 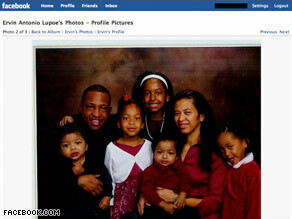 A photo on Ervin Lupoe's Facebook page shows his wife and five children. The bodies of five children and two adults -- the children's mother and father -- were found Tuesday in a home in the Los Angeles neighborhood of Wilmington. Among the dead, authorities said, were an 8-year-old girl and two sets of twins -- 5-year-old girls and 2-year-old boys. Ervin Lupoe apparently called 911 and contacted a television station by fax before committing suicide, authorities said. "No words can describe this tragedy," said Los Angeles Mayor Antonio Villaraigosa. "There's no way to comprehend this unspeakable act." Nearly simultaneously with the KABC call, a man called 911 and reported coming home and finding his family dead, Hayes said. But, Deputy Police Chief Kenneth Garner said, the man told KABC he had killed them. A suicide note found at the scene "indicated a business dispute" between Lupoe and Kaiser Permanente West Los Angeles Medical Center, Hayes said. In the faxed note to KABC, the man said he was despondent over an employment situation, police said. Kaiser Permanente said Lupoe and his wife, Ana, were both former employees of the medical center. Both had been terminated, Hayes said, with Lupoe's termination coming last week. It appears there were grounds for the termination and it did not come as a result of layoffs, he said. "There is no reason to believe this is anything other than a murder-suicide," Lt. John Romero said. "There is no current threat to the community, no active search for a suspect." The father and the three girls were found in one upstairs room of the home, the mother and twin boys in another, police said. Deputy Police Chief Kenneth Garner described the scene as one of the most grisly police have encountered. Authorities did not release the names of the woman and children. "Unfortunately, this has become an all-too-common story in the last few months," Villaraigosa told reporters. He urged those who have lost jobs to take advantage of available assistance and resources, including mental health agencies. "Job centers, foreclosure counselors, and mental health professionals are ready to provide whatever services are necessary to get people back on their feet and to keep families afloat," the mayor said in a written statement. City Councilwoman Janice Hahn said, "No matter how desperate you are, no matter how frustrated you are, to think this was the only answer -- to take your whole family with you in death -- is just too much to understand." Kaiser Permanente said it is cooperating with the police investigation. "We are deeply saddened to hear of the deaths of the Lupoe family," the company said. "Our sympathies are with all their extended family and friends at this time. We are also providing resources and support to our employees who are affected by this tragedy." A dozen police officers and detectives remained at the scene Tuesday afternoon and several surrounding blocks were sealed off by police. Authorities said at an afternoon briefing that a community meeting would be held later in the day at a nearby church. CNN's Paul Vercammen contributed to this report.